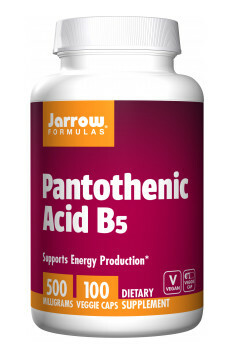 Jarrow Formulas Pantothenic Acid B5 is a dietary supplement which contains pantothenic acid (vitamin B5) in an organic form of calcium pantothenate in an amount of 500 mg in a single capsule. Pantothenic acid (vitamin B5) – is a water-soluble substance. It belongs to the group of B-vitamins. Structurally, it is an amide of pantoic acid and beta-alanine. It is necessary for each living cell. After absorption, it undergoes different metabolic transformations. As pantetheine, it is involved in reactions which lead to the forming of coenzyme A – a biologically active form of pantothenic acid, and ACP – a protein carrier of acyl groups. That is why it is necessary for numerous biological activities, especially for the metabolism of carbohydrates. In each cell, there is a kind of a central transport hub, more specifically – the metabolic node, in which numerous changes take place. It allows a smooth, dynamic combination of important metabolic pathways. The universal metabolic node is the active form of pantothenate – coenzyme A (CoA), which contains a –SH group, which can react with carboxyl groups of organic compounds. Then, it is created a connection with acyl radical – acyl-CoA. Particularly common, CoA merges with bicarbonate acetyl group (acetate radical), which can be derived from the conversion of pyruvate (a product of glucose breakdown in the process of glycosis), fatty acids (during their oxidation in the process of beta-oxidation) or certain amino acids (after prior deamination). Pantothenic acid determines the proper metabolism of proteins, sugars and fats. It accelerates the wound healing, soothes inflammations, participates in the production of adrenal hormones, prevents fatigue and improves the cardiovascular system. It is also involved in tissue regeneration, improves pigmentation and condition of hair and speeds up their growth. Moreover, it participates in the growth processes of the body system as well as affects the regeneration of skin, hair and nails. It also shows little anti-inflammatory properties and may seal epithelia. It is believed that it prevents the premature aging and formation of wrinkles, although it has not been proven clinically yet. Deficiency of vitamin B5 leads to nervous system disorders, learning difficulties, excessive irritability, pain, and stiffness of the joints, and premature hair greying. Also, there may occur fainting, depression, loss of coordination, feeling of numbness, tingling and cramping in the arms and legs, wobbly gait, hair loss, skin lesions, flushing and vision problems. To sum it all up, Jarrow Formulas Pantothenic Acid B5 is a dietary supplement recommended to make up the deficiency of pantothenic acid in the body system. It is especially recommended for women, due to the participation in the processes of regeneration of skin, hair and nails. It can be so applied in the diseases of skin and mucous membranes, as well as in the disorders of gastrointestinal tract. Comfortable form of chewing pastilles (! ); rebuilds intestinal microflora.